Every night, millions of Americans aren’t getting the proper amount of restorative sleep due to snoring and sleep apnea. The good news is that we offer convenient snoring and sleep apnea treatments to help you get the sleep you need and live life to the fullest. We’ve provided this guide to help you better understand sleep apnea and how it can be treated. 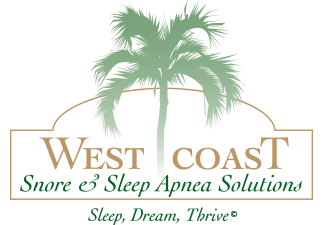 At West Coast Snore & Sleep Apnea Solutions, we want to help you Sleep, Dream, Thrive! During sleep, the muscles in the throat relax, narrowing the airway. As air pushes through these soft tissues it causes them to vibrate, producing a snoring sound. Snoring alone is not a health risk. But when irregular breathing patterns are paired with pauses in breathing as you gasp for air, you may have a more serious disorder known as obstructive sleep apnea (OSA). Obstructive sleep apnea is a common yet highly under-diagnosed disorder that robs the body of its ability to thrive. When a person is experiencing an apnea event, they can stop breathing for several seconds to several minutes at a time. Each time an apnea event takes place, oxygen quickly falls to dangerously low levels, triggering stress hormones to alert the body to gasp for air. These gasps for air also break the sleep and dream cycle, preventing the body from getting the restorative sleep it needs to function optimally. The most common way to diagnose sleep apnea is to undergo a sleep study, including an overnight exam conducted by a sleep specialist. The most frightening aspect of this disorder is that many sufferers do not even know that it’s affecting them. An individual with sleep apnea can have hundreds of apneic events every night and not even be aware of it. 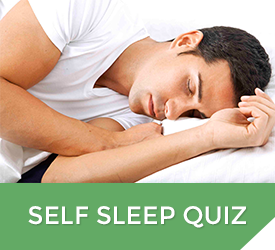 If you’re experiencing any of the above symptoms, we recommend that you have a sleep study performed. At West Coast Snore & Sleep Apnea Solutions, we also offer a convenient home sleep test that can give your doctor the information they need to diagnose your sleep apnea. The standard option for treating obstructive sleep apnea is the use of a CPAP machine to keep your airway open during sleep. The CPAP machine is made of an air pump with plastic tubing attached to a mask that’s worn over your face at night. Pressurized air is forced down your throat through the mask to keep your airway open. Many users find the mask uncomfortable and the pump too loud to fall or stay asleep. The sound can also keep your partner awake, putting a strain on relationships. For these reasons, many CPAP users simply stop using the device and continue to suffer from their sleep apnea, which puts them at a higher risk for additional health problems. Dental sleep medicine doctors have created a proven alternative to maintain the opening of your airway during sleep without the hassle of a CPAP machine. Oral appliance therapy is more comfortable and more discreet than traditional CPAP therapy. The small appliances make no noise so you and your sleep partner can get a full night’s rest. Oral appliances are small, effective, non-restrictive, and can decrease your health issues related to obstructive sleep apnea, allowing you to Sleep, Dream, Thrive!